Space.com staff celebrates Halloween at the office in New York City. In 2016, associate editor Sarah Lewin dressed up as Tabby's Star, the possible "alien megastructure." 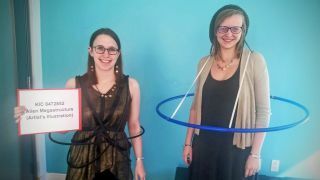 Staff writer Hanneke Weitering dressed up as Saturn, the hula hooping champion of the solar system. Happy Halloween! Space fans have come up with some pretty stellar costumes this year. From rocket cats to astro-babies and ghosts of spacecraft past, here are some of the best space-themed Halloween costumes we've seen this year. Watch a Minotaur (Rocket) Launch to Space This Halloween! Can't get enough of these amazing space costumes? Check out our picks for the best space-themed Halloween costumes of 2016.